These deck and fence post caps are designed to fit Actual or True sized posts measuring from 6 inches up to 6 1/4 inches. In addition to protecting your wood posts from rot and decay, they also serve as a simpe and elegant decorative landscape addition. 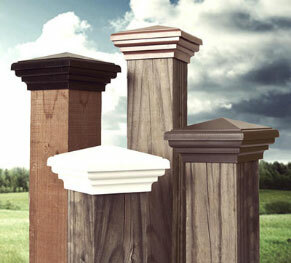 Our patented fence post caps come with a ten year warranty against fading, and UV damage. Installation is a simple and fast process using the base to secure the post cap, the top SNAPS into place and hides the screws. Clearance post caps can not be returned. Please be sure to measure your posts, sales are final. These post caps will not fit a Standard Pressure Treated 6x6 post. Fits a true (Actual) post. (6" x 6" to 6.25" x 6.25"'). These caps slide down the post 1.5” and are 7.5” x 7.5” at their widest point. Order online or 770-808-0200 to order by phone.